Climbing trip to Les Calanques in 2004. From left to right, Chad, Mathieu, and Erin. Sitting on the couch with my old Dell laptop, I remember scrolling through the lengthy American Mountain Guide Association's prerequisites on their website back in my college apartment in Bellingham, WA. I knew I could get through the ski guiding discipline with some work, but glancing at the rock guiding discipline made me unsure whether this was a possibility for me. To complete the program, one needs to have completed over 130 prerequisite climbs, 26 days of course and examination, guide routes up to grade V, and be confident leading 5.10+/A2 (sport and traditional). This list was intimidating to me as I had done very little climbing up to this point, and most was following my friends up routes. 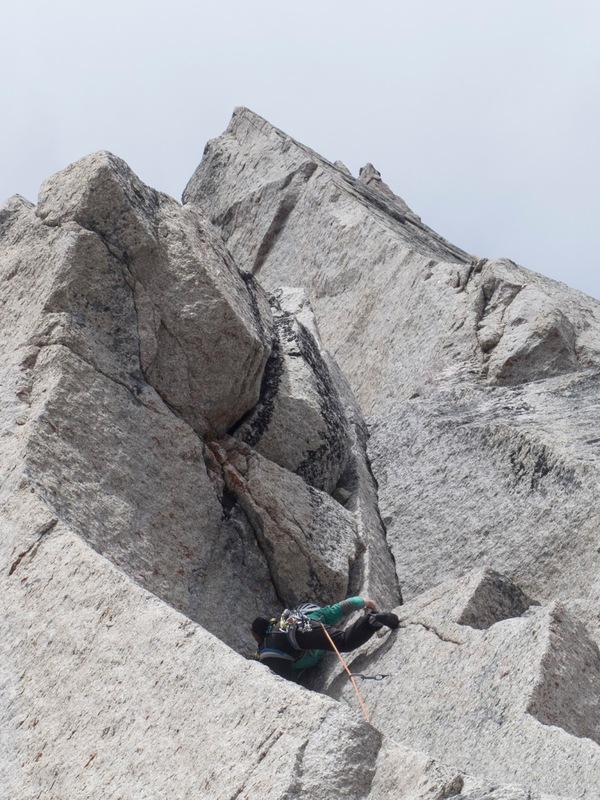 I climbed my first multi-pitch route in 2004. I was seventeen and spending my first winter in La Grave. During a high pressure in February, my roommate Chad asked if I wanted to join for a climbing trip down to Les Calanques. The thought of seeing the sea drew me in, so I said yes even though I wasn't much of a climber back then. We packed up our friend Mathieu’s tiny little maroon Renault and hit the road. 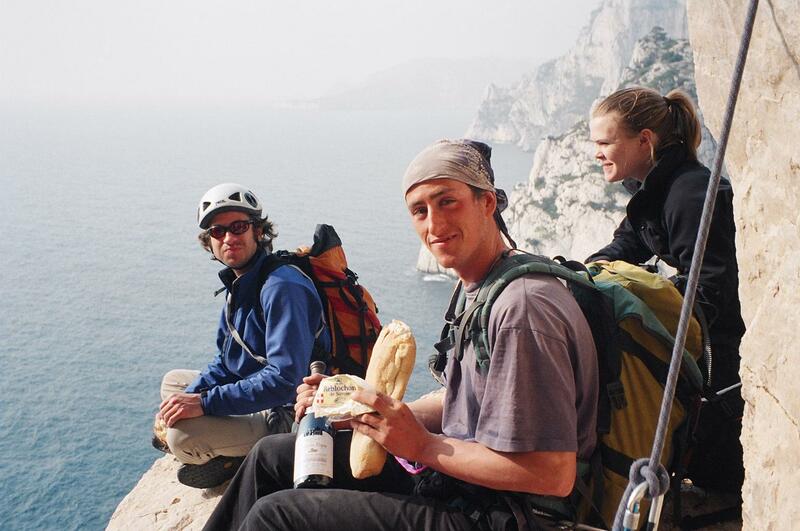 That trip was filled with sunny limestone, amazing dinners we cooked over a camping stove in the one bedroom hotel room the four of us were sharing, and icy jumps into the Mediterranean (it's pretty cold in February). My climbing adventures were off to a good start. I had been given advice before I left for La Grave, before living alone abroad for the first time. My high school friend told me “try to always say ‘yes,’ even when it might be a bit out of your comfort zone.” My friend had studied abroad in Paris, so I am pretty sure he meant the advice for social situations like always going to dinner parties and hanging out in different environments. In La Grave however, that advice had me skiing big lines with new friends, skiing steep couloirs, and yes, enjoying the occasional dinner party. I ran with that advice and was extremely lucky I survived that seventeenth year of my life I spent ski bumming in La Grave, but it also gave me a strong appreciation for life and adventure that has become part of who I am today. Admiring La Meije, and enjoying being seventeen and a ski bum in La Grave. Twelve years later now, I try to make decisions with more than an impulsive “yes.” I consider my abilities, the risk versus the reward, possible outcomes, and whether it's worth it. And yet, even with the growth and development of my decision making process, the advice from my seventeen year old self still lingers. take my rock aspirant exam. underneath the Dark Shadows wall. There was still a chance that my partner would get the lead though. Day one came and our fates lay with a single game of rock-paper-scissors for the first lead. My partner won, meaning he would start out and I would take the first lead the following day—Risky Business. That night, I called my friends who had climbed it before to get a better idea of how “bad” it really was. There were two main sections of concern: getting to the first bolt, then above the second bolt to your next piece of gear. Blowing either could result in a serious ground fall. I made my time plans, had a handful of backup plans, and decided I could only make my decision once actually looking up at it myself. The base is one of my favorite spots in Red Rocks. 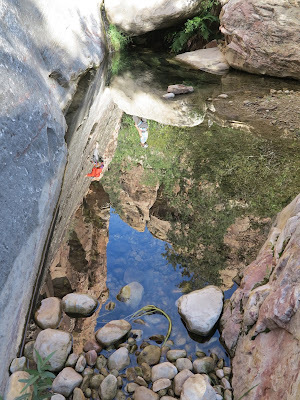 It's a beautiful oasis of ponds with small waterfalls running at the base of the beautiful black vanished wall of Dark Shadows above. I looked up at the moves getting to the first bolt. They looked well within my grade so I decided to go for it. I set myself up for success by catapillering the rope (only trailing one, not both), and set-up to haul my pack. Delicate and technical climbing is one of my strengths, as well as challenging mental leads. I might not like them initially, but I have found that I do well under their pressure. When I reached the anchor I smiled out of disbelief. I had said “yes” and put myself in an uncomfortable position, and succeeded. I still had 3 more hard pitches ahead, and more climbing and descending under examination after that so the concentration continued. Now that the ground fall potential was gone, the climbing felt easier, even though the grade got harder. The moves were uncharacteristically varied for Red Rocks. There were delicate slab moves with the tiniest finger slot to balance with on the black varnish, a sporty undercling to reach a mini jug on quality rock, and even a comforting hand jam. The gear was sparse throughout, but there was just enough. A challenging lead to be sure, but surprisingly smooth. 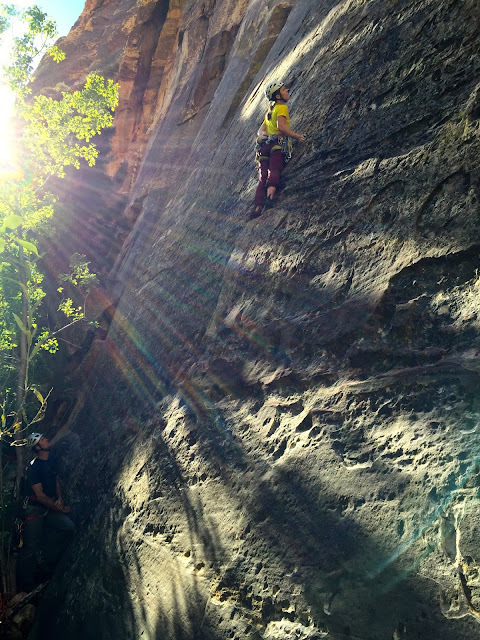 It made my mind work into a complete meditation, and allowed me to break through my fear and believe in my climbing abilities. 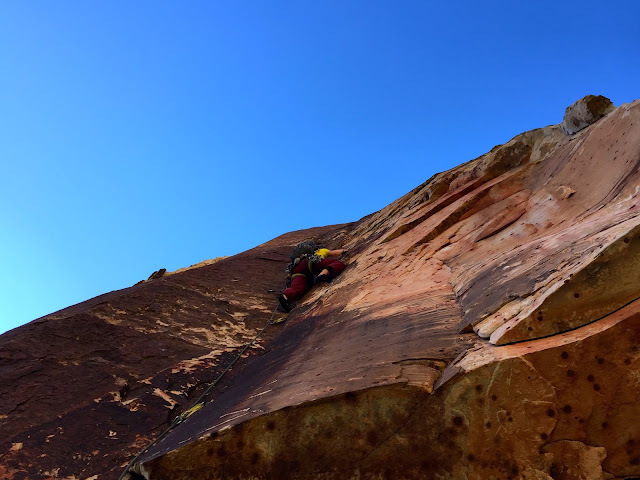 Erin starting up the first pitch of Risky Business (5.10cR Red Rocks). My examiner called the day after the exam was complete to congratulate me on passing. I still can barely believe it. Did I really just do all that? Erin heading up the second pitch of Risky Business. This began as an impossible goal. I pushed beyond my own disbelief almost every step of the way. Learning how to ignore the part of myself that didn't believe was a powerful tool in making this a reality. Now that I’ve reached this goal, I can’t wait to dream up my next impossibly.